A Man of War Towing a Frigate into Harbor Carington Bowles, 1781, British Museum. 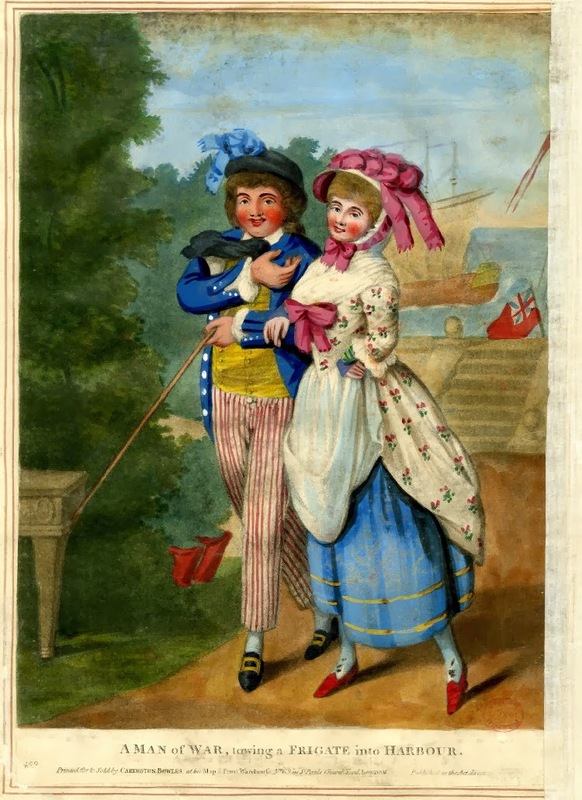 Bowles's satirical print is one of series that matched naval terminology with courtship. Other pieces use this device more humorously, but this example gives us a pretty generic view of a sailor of the period. The Jack wears a pretty standard black round hat with short brim and a preposterously large blue bow. It is rare to see round hats decorated with much at all, much less something this size, but being as these are shore-going clothes (which tended to be more fanciful), it is at least plausible that a sailor might have added this decoration. His hair is longer than most sailors, draping over his back, but it is still rather loose. The neckcloth is black silk, tucked under the white collar of his shirt. His waistcoat is a bright yellow, and double breasted with cloth covered buttons, ending at the waist. Our seaman's short jacket is single breasted with large white metal buttons at the lapel, and matching short buttons at his slash cuffs. Like many of the other images of sailors at the time, he only bothers to fasten one or two of his cuff buttons. The trousers are broad fall with a large white buttons at the waist, but it appears that the fall itself is held by cloth covered buttons matching the stripe of his trousers. This could also be an oversight on the part of the colorist. His stockings are white, leading to pointed toe shoes with large rectangular buckles of a yellow metal (probably brass). In his left hand is the familiar stick, seen in many images of sailors, including ones I've shown before.